It was gloriously warm the week prior to Spring Break. Then, Spring Break hits and it gets frigid again. I use Spring Break to bring out the warm weather outfits and put all the sweaters and wool garments to rest for the season. Where’s that box of wool sweater? I need them. During the last weekend of Spring Break, we were in KC and it actually snowed on Saturday. We drove home to a frigid night and a windy and cold Sunday. It was a perfect day for soup. Heat olive oil in a large soup pot. Add onions, celery and carrots. Cook for 3-5 minutes until soft. Add garlic and mushrooms and cook for one minute more. Add wine and let simmer until reduced to about half. Add rosemary, thyme, and orzo. Saute for a few seconds. Stir in beef stock, water, tomato paste, beans and salt and pepper. 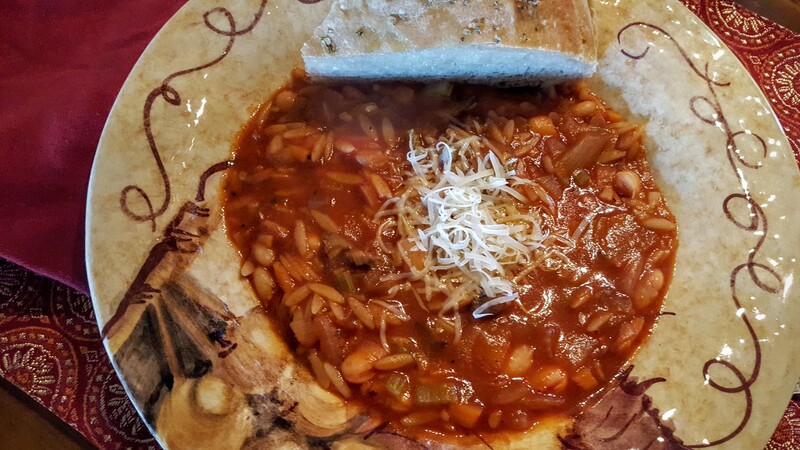 Bring to a boil, reduce heat and let simmer 10-12 minutes or until orzo is cooked. Stir often so the orzo doesn’t stick. Before ladling into serving bowls, taste and reseason as necessary. Top with a bit of Parmesan cheese. 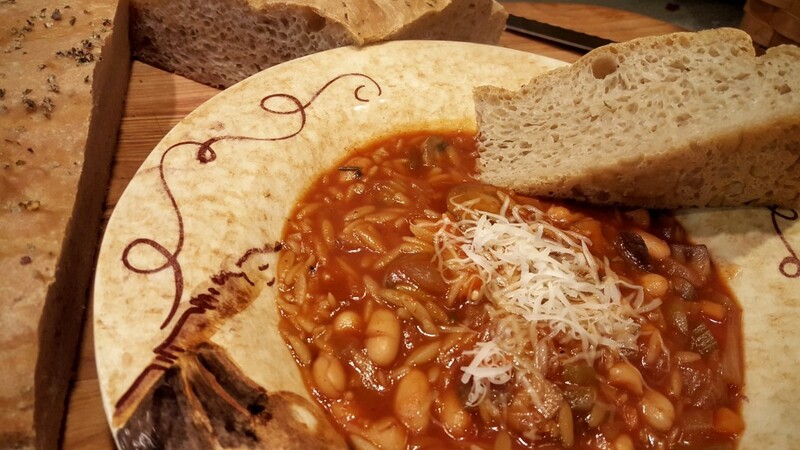 I created this soup to celebrate The Unprejudiced Palate: Classic Thoughts on Food and the Good Life by Angelo Pellegrini, the Cook the Books selection for February/March. (Simona of Briciole is our host this round.) Angelo M. Pellegrini was an Italian immigrant who spent his formative years growing up in Tuscany. His family was poor and he foraged and scrounged and worked hard as a youth, gathering mushrooms and manure to help make ends meet. Pellegrini’s life changed when his family came to America but he kept and promoted many of his traditional food beliefs, cooking young rabbits and amazing his friends with certain dishes featuring different varieties of offal. He also reminiscences about scaring away a potential girlfriend and her parents after serving songbirds that he stalked with a trusty slingshot. He served as a long-time professor of English at the University of Washington. I would not have enjoyed being in a class with him discussing Chaucer. I think he would have scared me. Would Mr. Pelligrini have approved of this soup that borrows his book’s title? I did not forage for the mushrooms or pluck the carrots from the garden; I did, however, clip the thyme and rosemary from our herb plot. And, this made a big pot, perfect for those impromptu guests that seemed to always be on his doorstep. (He was known for his culinary skill among his friends and acquaintances and they always seemed willing to partake at his table.) Of course, there is an entire section in The Unprejudiced Palate on soup, one that Pelligrini admits he had to consciously abbreviate because of the vastness of the subject. 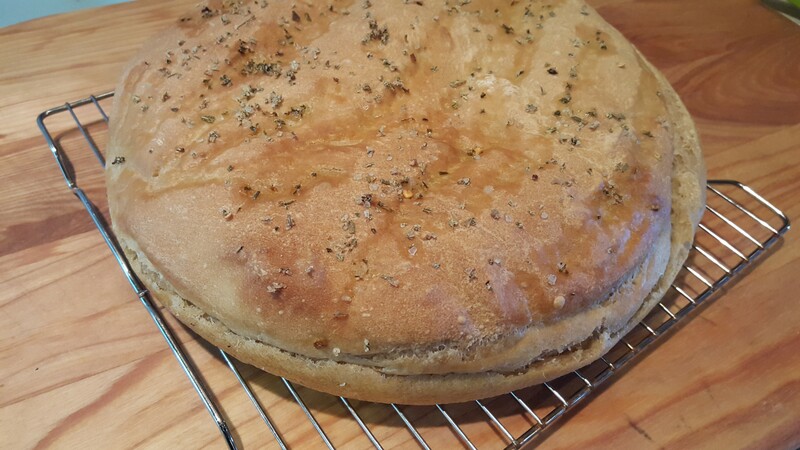 Professor Pelligrini, I did make my own bread. Bonus points? I may have to find a copy of The Food Lover’s Garden. I am sure that there is more I could learn from that old English professor. Please plan on joining Cook the Books for our next round, Burnt Toast Makes You Sing Good by Kathleen Flinn. Deb from Kahakai Kitchen is the host for April/May. I am also using today’s post to link up to Souper (Soup, Salad & Sammies) Sundays at Kahakai Kitchen. You ought to hook with Deb’s Souper Sunday at Kahakai Kitchen. the linkup is open now, I love adding a soup or salad to her linkup! I can’t believe you’re getting snow!!! It’s actually a little cooler here this week… but that just means highs of 65. LOL! Either way, this soups looks delicious! Snow was in KC which is north and east of us. (We took a much needed two day trip there the third week of March.) I am so ready for consistently warm weather though. It is coat season from 7 A.M. to 10:00 and then if we’re lucky, we can shed them at lunch. Sorry about your spring break weather. It sounds like temps are going to take a nosedive around here this weekend—perfect time to make soup. Yours looks scrumptious! Huddle in and make soup and hope for warmer weather. Love your review as we had some similar feelings and your soup of course which looks fabulous, satisfying, and delicious. I was tempted to put beans in mine but I felt like I already had too much going on. 😉 Yes, I am sure you would have gotten Pelligrini bonus points for the lovely homemade bread accompanying it! 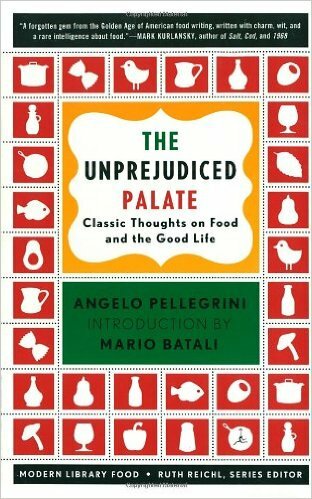 A few years ago I read what I prefer to call “The Prejudiced Palate.” I found the author a tedious, tendentious self-advertiser, as you hinted when you said “He considers himself the authority on cooking, gardening, and wine.” You thought he might be right, but I didn’t find any evidence that he was. Your soup, despite its inspiration, sounds quite nice! Thanks, Mae. I so enjoyed your review. Glad you sent me the link. 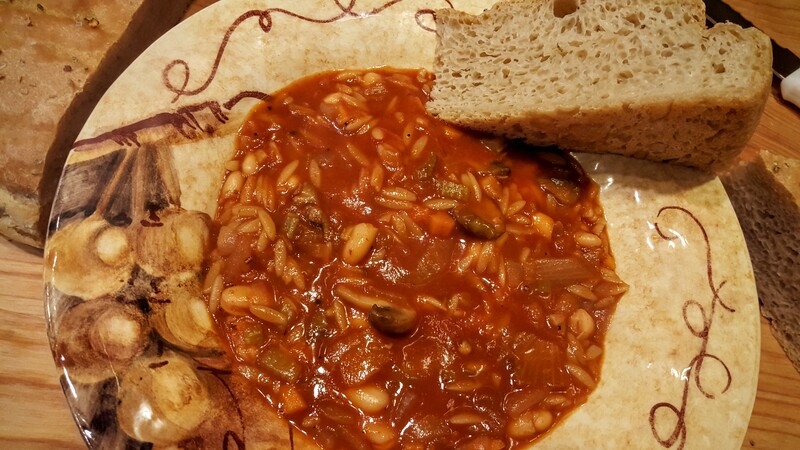 The soup looks so warming and comforting and that homemade bread looks fantastic as well, Debra. The bread was great for dipping. Weather! Always interesting, often in ways that are distressing. Sorry about your spring break. But happy you made this soup for us! Super recipe — thanks so much. Spring break was great and a much needed relaxing time. That is one hearty sounding soup! I would definitely be dunking for sure!!! I don’t know of Mr. Pelligrini but I’m sure he would approve of this classic robust soup. But the weather is beautiful now, Louise. It’s been a bit chilly out in California even. The weather keeps fluctuating. Thanks for the tip on The Unprejudiced Palate. I will have to pick it up. I also asked myself whether I would have liked being in an English class with him. I imagine though that for the time he was probably an interesting professor, tending zucchini and crushing grapes in his spare time. Definitely bonus point for baking your own bread 😉 Thank you for your contribution to this edition of Cook the Books. I imagine that he was loved by his serious students, especially those who were invited over for supper. At least you had a consoling soup for bad weather! When I cook these days there’s always too much (just 2 of us now) so end up freezing the excess; good when a cold day arrives, to pull out some soup. Your soup looks perfect! We always get April snow, so I feel y=for you & your snowy spring break weather! I was horrified to discover that American faculty clubs are *not* equipped with bars! He should have taught in an Australian or English university. I didn’t know that. We do have a lot to learn. Great minds Debra…I went with soup as well. Your version sounds delicious. I’m laughing here now because I am confusing book club cooking LOL. I made pasta for this book and the soup I made was for BCCBCC. Hahaha. It’s hard to keep up. i agree. I think the book has to be taken within the context of the time it was written.